There was much confusion over the date of this walk since the Annual Dinner had lately been brought forward a week in to the walks slot. Only six people turned up - Roger Sagar, Bill Clayton, Dave Archer, Derek Hatch, Arthur Helsby and Ken Fyles. This is a walk that you won't find in the walking guides even though it covers some very varied and beautiful territory. Starting from the Cat and Fiddle Pub we traversed the southern moor to then plunge into the valley of the River Dane towards Gradbach. From here, a NNW path took us through wood and high moorland before descending into the wooded area of Wildboarclough and lunch at the Crag Inn. A drink stop at the Three Shires Bridge on the River Dane. The speciality of the Crag Inn is a Sunday carvery - a little pricey at £9.50 but you can eat as much as you want and have large helpings of all three meats if you're really hungry after the morning's walk. Return from the Crag Inn was made via Clough House and delightfully remote valleys running eastwards then northwards. A round trip of about 10 miles. 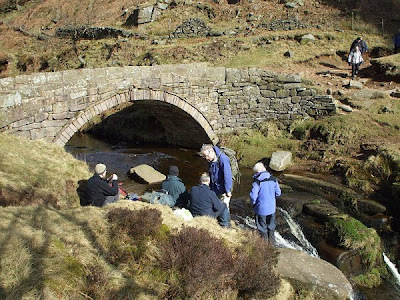 Sunday the 11th saw JeffB, Gail, Mike, AndyG and also Richard at Windgather Rocks looking for some easy climbing in the sunshine after their exertions of the previous day at Almscliff and also White Ghyll. 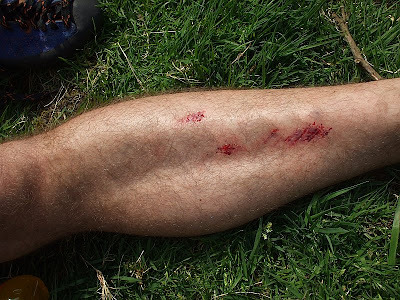 However, despite his claims to have led the route flawlessly just a few minutes earlier, Mike fell off while seconding Mississippi Crack sustaining a nasty looking graze to his shin(or should that be a graze to his nasty looking shin?). Next, Jeff found himself a mission. He did some fairly run-out leads and then gave up using the rope at all. 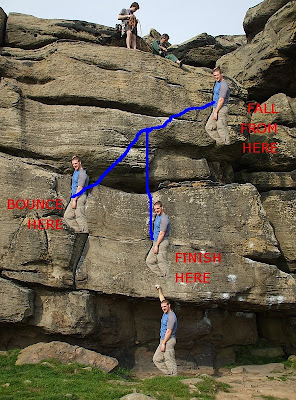 It appeared to be his intention to solo every route he could find at his grade, ticking them off in his Rockfax as he went along, plus a few that aren't even in the guide book. It was Jeff's first time at Windgather, so these were all on-sight ascents and very commendable. After her experiences in Wales, Gail seemed to find the place a little small and uninspiring. Never the less she got some more practice at lead climbing, including placing gear and setting up belays which can be problematic in places at Windgather. Gear placements on the top of the crag can prove elusive for the inexperienced and can require a little ingenuity to use effectively. AndyG got a bit sunburnt to add to the discomfort of his injuries from Almscliff yesterday and he experimented with the video mode on his digital camera which will hopefully result in more video action on the website in future. Anyway, here is the video of Mike top-roping "Traditional". Although Richard increased his tally of leads, Jeff's enthusiasm for un-roped climbing seemed to rub off on him. After it was time for the rest of us to leave, Richard stayed behind to enjoy another hour or two of bouldering in the quarry at the far end of the rocks. Only 2nd time I've ever been to Windgather when sun is out - very different from last time, when ledges were iced up. Really good to climb Green Crack again, this time without the slippy white footholds. Much easier!! Think the following summarises routes? Any errors? Good to try a few different routes as well (The Rib, The Rib Rt Hand and Traditional). Despite the threat of rain, Graham and Jeff kept the faith and travelled up to Langdale for a fix of Lake District rock. Although there was some cloud cover, it was bright and warm. After being fleeced for parking, and with boasts from AndyG that he and Mark were basking in glorious sunshine at Almscliff, they headed up the relentlessly steep fellside into the deep gash of White Ghyll. The crag forms one bank of the ravine and is made up of an impressive array of corners, arêtes, slabs and roofs. The majority of the rock is of the finest Lakeland quality – solid, with superb friction and positive holds, but there are just enough loose blocks and flakes dotted about to keep you on your toes. Several parties were already occupying routes, but Haste Not was vacant so, since he had enthusiastically racked up his shiny new gear, Jeff led off up the first pitch. The crux second pitch traverses for about 15 metres under a formidable barrier of roofs, and wiiiiiide bridging and a looooooong reach are required to descend a bottomless groove and swing around a rib. This brought heckles of jealousy alluding to Graham's lanky physiology, but left Graham cursing his height while trying to wiggle a wire in with his knees round his ears. A nervous glance down to take in the view luckily revealed a small ledge that allowed a little more comfort, and from there it was onwards more easily to the stance, accompanied by dry mouth, a few spots of rain and a party on another route. Suitably encouraged despite the threat of rain, the pair continued with The Gordian Knot, and after Graham had got too engrossed and climbed 5m too far up the first pitch, he did eventually return to the first stance to bring up Jeff. Again the second pitch provides the meat of the route, and Jeff made his way to a hanging corner, placed a solitary, not exactly bomb-proof small wire and eagerly pressed on upwards. However, at some point during the 5m, his hexes were jettisoned when he unwittingly decided he was carrying too much ballast for such a bold and sustained lead. An impressive lead indeed, considering the amount of suspect rock and the exposure through the crux. After a late lunch it was decided to round the day off with Slip Knot. Jeff, still beaming from the previous route, led up pitch 1, clearly enjoying the easy technical moves up the slab to the roof. The second pitch starts off with exciting and thought provoking moves, and Graham soon found himself in a stunning position, looking down the gill beyond the roof to the beckoning pubs in Langdale. He scrambled to the top where he could relax in safety as he watched sheep on the fellside opposite the crag trundle boulders into the bed of the ghyll. Somehow it was 8pm, and after 3 excellent routes there was only one thing required to make the day complete. The New Dungeon Ghyll Hotel was fortunately on the way back to the car, so the obligatory beer was duly dispatched. On Saturday 10th of May, Mark and AndyG went to Almscliff in Yorkshire. Looks idyllic, doesn't it? A pleasant little knoll surrounded by lush green meadows. 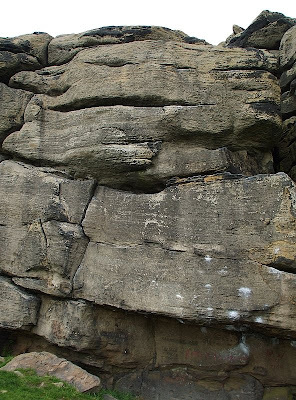 It should be a wonderful venue for a little bit of bouldering, with maybe a few small solos on the side, and a chance to unwind after the stresses of the working week. How wrong can you be? This is Yorkshire gritstone, the Devil's own rock, and despite the apparently tranquil setting, a place that lives on in the memories of thousands of tortured souls. Don't let the little bird deceive you, this place can strip the flesh from your bones. Come here at your peril and count yourself lucky if you only lose a little blood or maybe some skin from the backs of your hands. The day started innocently enough with some pleasant warm up climbs on Low Man just past the Matterhorn Boulder. Fluted Columns 14m VDiff P1 Pre 1900 3* was pleasant enough and this was followed easily enough by Pinnacle Flake Climb 12m S 4a P1 Pre 1912 1*. Then things became a little more problematic with Fluted Crack 14m S 4b P1 Pre 1900 which required the use of a no. 11 Hexcentric. After that the place started to reveal it's true colours with Square Chimney & Whiskey Crack 15m MVS 4b P1 Pre 1912 3* which started with a strenuous thrutch despite following the advice of the guide book and ascending in traditional "back and foot" style. After a brief inspection of Pigott's Stride and a solo of a little slab around the west side, things got a little more serious with an ascent of The Traditional Climb 10m VS 4c P1 Pre 1923 2* which has an awkward move left quite low down. 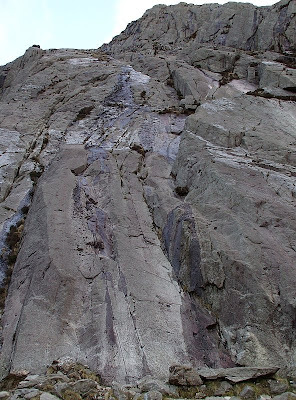 Next came Demon Wall 10m HVS 5a P1 194 3*, the name should have been a clue. After that, all was lost. 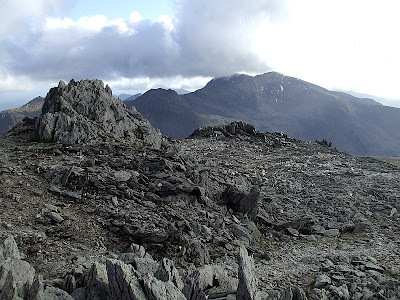 Despite a solo of Stomach Traverse 12m VS 4c P1 Pre 1894 by Mark, after the loan of a bouldering mat, and a final desperate ascent of Pothole Direct 10m VS 5b P1 1938 the place had taken it's toll. We were broken, beaten men, mere shadows of the climbers we once aspired to be. Our hands will heal with time but our souls will bear the scars forever. 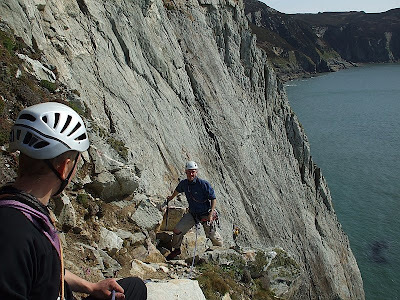 Graham, AndyG, Gail, AndyC and Richard all journeyed to Anglesey on Friday 2nd of May to discover the delights of Gogarth. 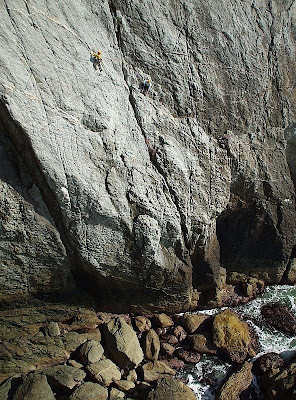 A trip that for most of them was their first ever experience of sea cliff climbing. Saturday the 3rd of May saw us parked at the South Stack Cafe bright and early. 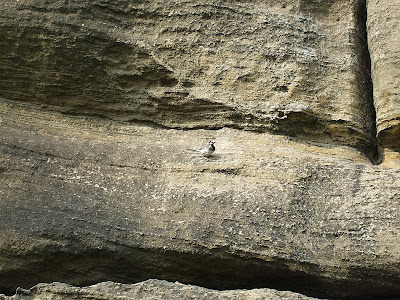 We had a brief look at the cliffs, and their resident sea-birds, before setting off to find Holyhead Mountain for some warm-up climbs. The crag is divided into a series of slabby buttresses referred to in the guide book as "ramps". We were pleasantly surprised by the quality of the quartzite rock and did a variety of climbs including Plimsole which was Gail's first trad lead. Time passed quickly and before long we were already late for lunch which naturally consisted of coffee and cake in the cafe. 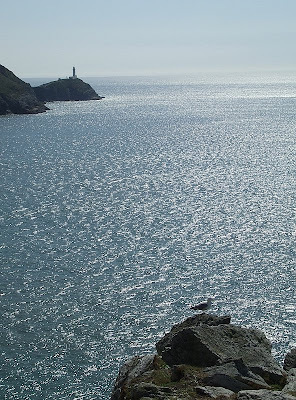 Then it was time for the main business of the day, Lighthouse Arete in the Castell Helen area of the South Stack cliffs. 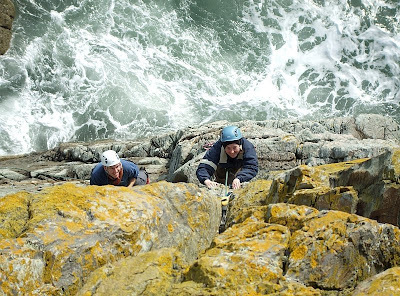 This requires an abseil descent to a niche not far above the water. Then, after you have pulled down your ropes, all that is required, is to climb back up again. It couldn't be simpler. It's also incredibly exciting. The crashing waves and rising tide lend a certain sense of urgency to the procedings. Fortunately, AndyG had done this route before with PaulV so he was able to lead the way. Unfortunately, when it was his turn to lead, Graham got a nut stuck whilst building his belay which caused considerable delay. AndyC and Richard, who were still waiting far below in the niche, must have wondered what on earth was going on. Eventually, we got going again and AndyC was able to follow, although it was getting late before he and Richard arrived safely back at the top of the cliff. Despite Gail complaining about the unflattering photography, everyone seemed very impressed with their first taste of sea cliff climbing and announced that they wanted to do "A Dream of White Horses" the next day. Sunday the 4th of May started grey and damp. We drove through Holyhead and out to the car park in the Breakwater Quarry Country Park. Despite the deepening gloom and the odd spot of rain we walked over the headland and descended to the promontory overlooking Wen Slab. After surveying the route and discussing tactics we decided that we not happy with the weather and that we would walk over to Holyhead Mountain to do something easier while we waited for the weather to improve. In less than twenty minutes it was hammering down with rain and we retreated to the cars for the short drive back into Holyhead where we took shelter in The Internet Cafe which did Coffee and Tea Cake for only £1. 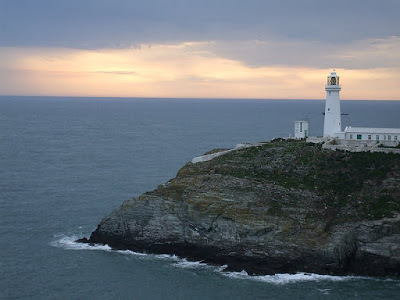 Eventually, the rain eased off slightly and in a fit of enthusiasm we drove through the fog to the cafe at South Stack where AndyG again showed the way with a very scrumptious Coffee and Carrot Cake. Finally, after awakening Gail from her slumbers, we decided that despite the persistent fog it should now be possible to climb something since the rain had finally abated. So we set off through the fog to try and find Holyhead Mountain again. Surprisingly, not long after we started climbing, the fog cleared to reveal not only a beautiful sunny late afternoon but also the unanticipated arrival of Jonah and Steve and several other parties whose approach we had been unaware of. 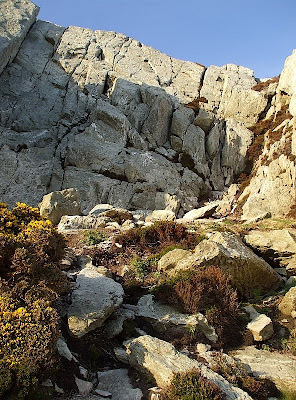 So we made the best of the day climbing until late into the evening, when it was time to sample the delights of a Holyhead chip shop. Monday the 5th of May started early, at about five fifteen in the morning, when the fog horn at the South Stack lighthouse could be heard booming around the campsite. After waiting till a more reasonable hour, we got up, struck camp and drove back through Holyhead for another look at Wen Slab. There wasn't much to be seen in the mist but we decided to continue since the forecast was good and no rain was predicted. 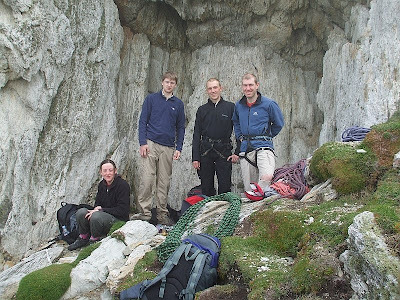 Leaving the others, AndyG and Richard descended to the end of the promontory overlooking the slab and abseiled down a chimney in the seaward face to a small ledge, the start of Britomartis. At first it was gloomy in the mist and all that could be heard was the crashing of the waves and the booming of the fog-horn. After thin and committing moves around the arete and out of sight of the initial belay the route slowly and strenuously ascended the steep wall until it reached a small sloping ledge with a few rusty pitons for protection. 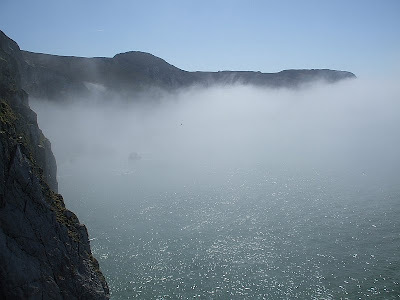 It was a stunning position, looking straight down onto the sea and the passing kayakers who appeared out of the slowly receding fog. 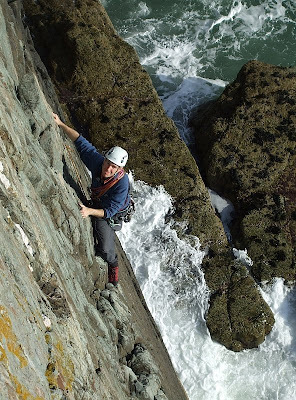 After going off route by following an inviting line of juggy holds which led further up the steep wall above, we eventually found the right way along and up some ledges which led to the final corner and the top of the cliff. An excellent route, not technically difficult and with good obvious holds, but also steep, a little strenuous and very committing. By now the weather was much improved, the fog was clearing and the sun was already blazing down from a clear blue sky. 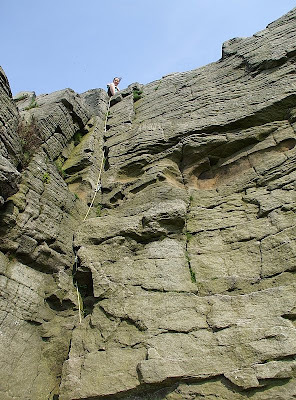 Then AndyG got some prussiking practice, after having to descend again when the abseil rope got jammed in a crack when we tried to pull it back up. Then it was time to have a bite to eat and enjoy the views whilst photographing some other climbers who were just starting up the slab above the jumbled boulders exposed by the receding tide. Meanwhile, the others were making good progress on "A Dream of White Horses". Ably led by AndyC, they had missed out the first pitch due to the high tide and abseiled straight to the belay at the start of the second pitch, with the delicate and insecure step across just before the next belay. Graham led the next pitch, up the big flake and across to the Concrete Chimney. AndyC took the lead for the final traverse across the headwall above the arch. Although not technically difficult, many people find this the most entertaining pitch because of the exposure and the consequences of falling in such a position. The intrepid crew, including Gail who was on her first HVS, all arrived safely with big cheesy grins on their faces. 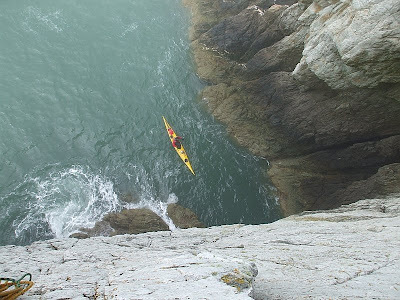 The next time AndyC and Graham are on Anglesey the tide tables will be receiving close scrutiny because there is the first pitch to be climbed before they can claim the full tick for the route. After all that, we decided not to rush back home in the hope that we would avoid some of the bank holiday traffic. The sun was warm, we ate the last of our food and we watched seals swimming near North Stack. All good things come to an end and eventually our stomachs got the better of us. So we packed up ready for the drive home, via the chippy in Conway. 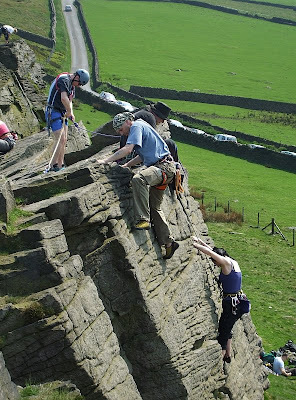 A Day's Pocket Pulling at Beeston Tor. So what did me and Ste think about Beeston Tor? Well..... 8 stars in total, 156 meters of climbing, 4 routes and 8 pitches, with the easiest route of the day being HVS. I suppose it would be an understatement to say we loved the place(oh, not to mention that we had perfect weather all day). The Thorn 48m 3 star HVS...... Pitch 1 4b a fingery slab but a good warm up. Pitch 2 5a warm up definitely over slightly overhanging with a problematic bulge and some bushwhacking to top out. Well worth the 3 stars! Pocket Symphony 38m 2 star E1....... Pitch 1 4c a simple enough climb that also served as the first pitch to the next two routes so after this ascent, the ropes where ditched and we soloed to the first belay. Pitch 2 5b More fingery climbing with as the guide book states 'surprises a-plenty', the biggest surprise coming as I strayed off route making an almost unreversible move. Ten minutes later after allot of sweat and swearing I was back on route and on the top. Deaf Dove 38m 1 star E2........ Pitch 1 as stated above. Pitch 2 5c yet again more pockets only this time smaller and further apart, a full on pump-fest especially when fiddling in threads through tiny holes. Evensong 38m 2 star E1........ Pitch 1 as above. Pitch 2 5a Probably the easiest route of the day or it would have been if we weren't so pumped. However we were soon back on top taking in the view and enjoying the late afternoon sun. Then that was it, day over, after a quick abseil down we packed up and plodded back to the car utterly done in. All routes lead clean on-sight by me and seconded by Ste. Sorry no pics, as usual I forgot my camera. 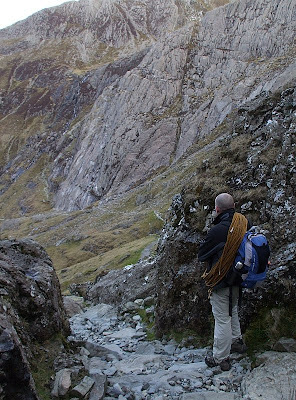 On Thursday 1st of May the prolific JeffB, and your news editor AndyG, went to Wales for a bit of easy mountaineering. After a leisurely start compounded by slow traffic in Warrington and in the road works outside Queensferry, we arrived at Ogwen and proceded to the Idwal Slabs. Not surprisingly, given the lateness of the day, it was quite busy and the best route, Tennis Shoe, was already occupied by two teams. So we decided to have an adventure. Knowing that most routes on the slabs are technically within our grasp, we set out up the rock, without consulting the guide book, to find our own way to the top. This produced three long pitches of pleasant slab climbing on the delightfully rough and pocketed Idwal rock. Later scrutiny of the guide book determined that we had started up Charity and, after a little diversion of our own along a beautiful rounded arete, we had finished up the final pitch of Hope. So far the weather had been kind to us and the day was warm and bright although some impressively large black clouds had already passed over. Finally the inevitable happened as we set out to follow a party from Plas y Brenin up Lazarus on Holly Tree Wall. We were lashed by a vicious and torrential hail storm which covered all the ledges and holds with hard granules of ice, briefly turning the place white and lending a distinctly wintery feel to the procedings. We caught up with the party from Plas y Brenin at the top of the first pitch in Javelin Gulley. After some discussion they allowed us to climb past, since they were intending to abseil back down. They excused their decision on the grounds that their rope system was unsuitable for leading their clients in the newly worsened conditions but anyone who has been to Plas y Brenin will remember that the instructors always like to be back in time for tea and cakes at four o'clock. However, we had more time to spare and were determined to press on. The next problem was that just as quickly as it had arrived, the hail was melting and our route was now deluged with water. A steady lead and careful gear placement was required. For added interest, we encountered two particularly loose flakes which required special care given our situation high above the slabs. 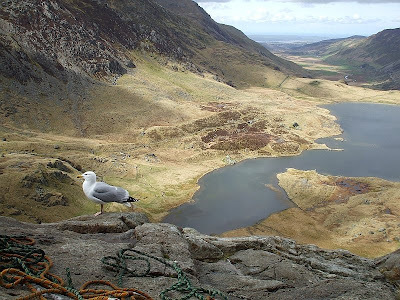 We stopped for a bite to eat on the next ledge and admired the fine view across Llyn Idwal and down the Nant Francon in the now much improved weather. Next Jeff had a look at Groove Above but we eventually settled on The Arete to get us over Continuation Wall. Then we put away our ropes and gear ready for the scramble up Senior's Ridge to the summit of Glyder Fawr. Although the weather was now fine again, many parties had retreated during the hail shower and we had the summit all to ourselves. We enjoyed extensive views in all directions, including a particularly good view of the Crib Goch ridge and Snowdon. Finally, we descended via Llyn y Cwn, and the path beside the Devil's Kitchen, to Ogwen Cottage where Jeff had parked the car. It was time to get some chips.